President Trump wants to cancel an automatic pay raise set to take effect next year for federal civilian workers. Federal workers were to get a 2.1 percent across-the-board raise in January, with more for those who live in high-cost areas. But in a letter to House Speaker Paul Ryan on Thursday, Trump wrote, "We must maintain efforts to put our Nation on a fiscally sustainable course, and Federal agency budgets cannot sustain such increases." Trump put the cost of the raises associated with high-cost areas at $25 billion. Members of the military are still set to receive a 2.6 percent pay hike. The letter, while indicative of the Trump administration's often adversarial stance toward the 2 million-member federal workforce, is largely symbolic. Congress will ultimately decide whether federal workers get a raise. 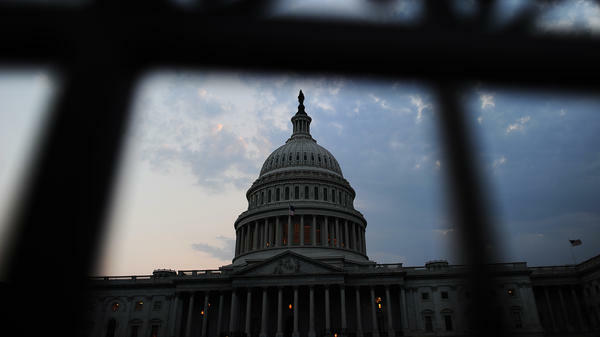 The Senate has approved a 1.9 percent pay hike as part of a spending bill for federal agencies, while the House included no raise. It will be up to congressional negotiators to arrive at a compromise. And so far, the administration has not threatened to veto the spending bill if it includes a pay raise. J. David Cox, president of the American Federation of Government Employees, the largest federal workers union, issued a statement urging that Congress "follow the Senate's lead and provide federal employees with a modest pay adjustment in January, which would help prevent workers from falling further behind next year and help federal agencies recruit and retain the high-caliber workforce that the public expects and deserves." During the Obama administration, federal pay was frozen for three years. Trump said the pay freeze "will not materially affect our ability to attract and retain a well-qualified Federal workforce." While the president cited the effect of civilian raises on the deficit, administration-backed tax cuts and spending hikes are set to add more than $1 trillion to the deficit over 10 years, a fact not lost on critics of the pay freeze. Sen. Mark Warner, D-Va., said in a statement that Trump "ballooned the deficit by trillions of dollars with a tax giveaway primarily benefiting big business and the wealthiest Americans. I can think of nothing more hypocritical or disingenuous than to turn around and throw hardworking federal employees under the bus on the pretext of fiscal responsibility." The Trump administration has previously proposed cutting federal employee retirement benefits. It also issued a series of executive orders that would have made it all but impossible for federal employee unions to operate in federal buildings and to ease rules on firing employees. A federal judge overturned many of the provisions last week, and the administration says it will comply with the order.